Fox Home Entertainment has announced that the latest seasons of Archer and Legit will debut on Blu-ray and DVD January 7. We don't have any pricing details, but take a look at the special features details and cover artwork for both of these sets below. 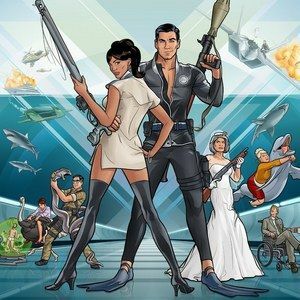 Swing back into action with Sterling Archer - the world's greatest spy - and the agents of ISIS for another hilarious season of cocktails, carousing and animated awesomeness! Follow the team around the globe, from the mysterious Bermuda Triangle all the way to the Vatican, as they bicker, backstab and bumble their way through assassination plots, an ill-advised marriage, an unexpected pregnancy, and a venomous snake bite in a very, very bad place! Packed with terrorist threats, sexual shenanigans, and all things inappropriate, Archer: The Complete Season Four comes fully loaded with outrageous top-secret extras! This outrageous new comedy stars Australian Jim Jeffries as an edgy, foul-mouthed stand-up comic living in Los Angeles, struggling to make his life and career more "legit." But every time Jim tries to do the right thing, his good deeds turn into wildly inappropriate and utterly hilarious escapades. Joined by his neurotic best friend and roommate, Steve, and Steve's wheelchair-bound brother, Billy, Jim takes comedy to a whole new level, whether it's visiting a Las Vegas brothel, partying with the mentally-challenged or trying to pick up women at a gay bar.